Something a little more out of the norm today. I love seeing different graphic liner styles and although this one is quite basic (yet effective) I think it's probably my favourite style that I've seen up to date. What's best is that it only needs a few products and a steady hand to create. The Inglot gel liner is perfect for creating something a little more outlandish when it comes to eyeliner, as this stuff sets into place really quickly and from my personal experience is less likely to budge compared to the other gel liners that I own (MAC Fluidline and Maybelline Eye Studio). I used a couple of different brushes for this: A small angled brush from BH Cosmetics to create the shape of the wing and my usual Screenface Domed Eyeliner Sable brush to work on the eyeliner that sits along the crease. Admittedly, it's not something that I would actually wear out, but I do love it nonetheless. Thank you for your feedback, Zuocienie! Hi Nicola! 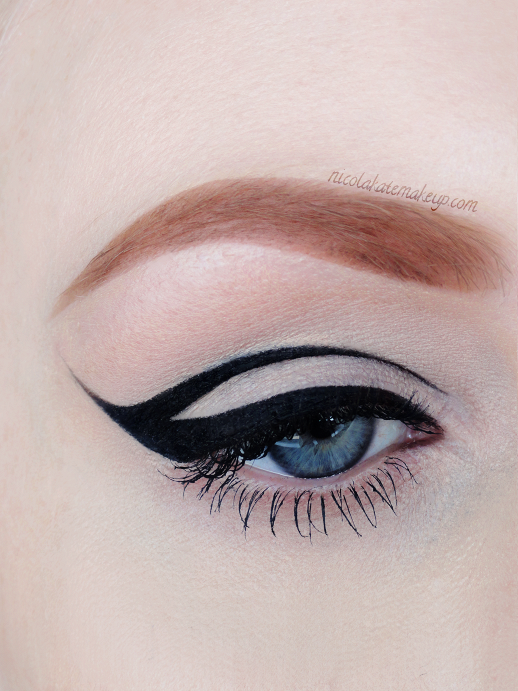 I like so much this makeup and you're amazing :) Is Inglot gel liner your favourite eyeliner? Have you ever tried Blacktrack Fluidline by Mac? Do you think that Inglot gel liner is much better?